The Boston Landmarks Orchestra will perform “The Blue Planet” by Peggy Stuart Coolidge (above) in its season debut concert. An English horn sings out above rustling strings and a flute answers with a sylvan call, a moment of serene simplicity before the melody blooms into full orchestral splendor. So begins “The Blue Planet,” a stirring orchestral work written for the World Wildlife Fund by Boston composer Peggy Stuart Coolidge (1913-81). There is an air of Coplandesque American utopianism in its sweeping sweetness, and years of Tin Pan Alley songwriting seep through in sustained smoky chords. During her life, Coolidge’s work was performed in venues as distant as Tokyo and Moscow and as nearby as Symphony Hall, but in recent years, performances have been less frequent. The Boston Landmarks Orchestra performs “The Blue Planet” in its season debut concert on the Esplanade Wednesday, bringing home the work of this tenacious, prolific composer. In a phone interview, Boston Landmarks Orchestra music director Christopher Wilkins says he first found Coolidge’s work on an LP compilation of American music. “By the time she died . . . I was already playing music and very active in the area, and I just wasn’t aware of the name,” said Wilkins, who went to Harvard’s Arthur and Elizabeth Schlesinger Library on the History of Women in America and Eda Kuhn Loeb Music Library to delve deeper into Coolidge’s life. Luckily, the composer meticulously documented her work and correspondence. Everything from childhood scrapbooks to Christmas cards from Gene Kelly and Princess Beatrix of the Netherlands can be found in those boxes. Born Peggy Stuart in Swampscott and educated at the Winsor School, Coolidge began composing at the age of 9. An avid figure skater as well as a musician, she got her first big break through her involvement in the Boston Skating Club, which typically put on a yearly ballet set to Gershwin’s “Rhapsody in Blue.” The producer asked her if she would write something instead. The piece that resulted, “Cracked Ice,” was played at Madison Square Garden in 1937, and later orchestrated by Ferde Grofé for performance by the Boston Pops, with Coolidge as piano soloist and Arthur Fiedler conducting. 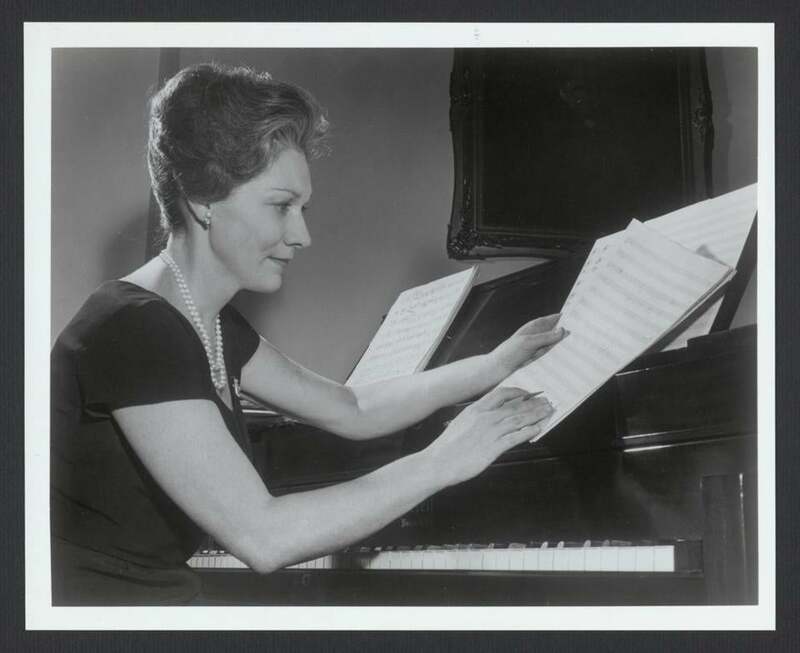 In subsequent years, Coolidge’s name regularly appeared on Boston Pops programs as composer and soloist, for pieces including “Night Froth,” “Twilight City,” and “The Island.” She also founded and conducted the Junior League of Boston Orchestra. After the war, she moved to New York City. Her personal writings indicate a keen, wry sense of humor. “A Grotonian who became a free-lance writer who can’t spell on everything from jet engines to sonnets,” she wrote to describe Joseph Coolidge, her husband from 1952 onward. Outgoing and well-connected, he was also often her lyricist and more — “a show-business entrepreneur who married his only client,” as she wrote. And Joseph’s connection with the World Wildlife Fund may have brought about the commission that became “The Blue Planet.” According to WWF spokeswoman Sarah Fogel, Joseph’s cousin, Harold Coolidge, was a founding director of the organization’s American branch. One of these connections was Aram Khachaturian, best known for his “Sabre Dance,” and this connection led to Coolidge becoming the first American woman composer to receive an official invitation abroad from the Soviet Composers Union. Before her 1965 departure, a flag was flown over the US Capitol in her honor. She performed in Warsaw and Moscow and was inducted into the Soviet Academy of Artists as an honorary member.